OXFORD, Miss. – One is a wedding violinist. Another is an award-winning broadcaster with a love of journalism. And one was a star lacrosse player. These are just three of the 14 freshmen this fall at the University of Mississippi’s Sally McDonnell Barksdale Honors College who received a total of $434,000 from four of the university’s most distinguished scholarships. 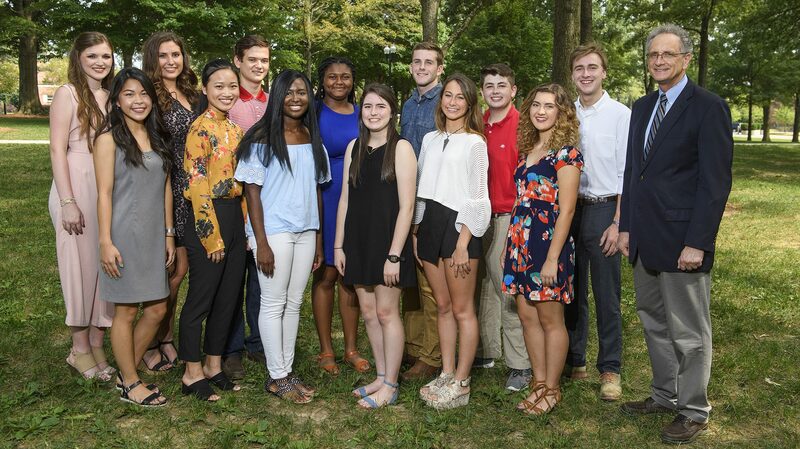 Four of the freshmen earned McDonnell-Barksdale Scholarships, six were recipients of Doris Raymond Honors Scholarships, two were awarded Harold Parker Memorial Scholarships and two were honored with Annexstad Family Foundation Leaders for Tomorrow Scholarships. “We are very proud of our students who have been awarded one of our prestigious SMBHC scholarships,” said Douglass Sullivan-González, Honors College dean. “These students have already lived the model of citizen and scholar at their high school, and bring this engaged ethic to our campus, and to the Honors College in particular. Students receiving McDonnell-Barksdale Scholarships are Qing Yun Li, of Oxford; Kayci Bearden Kimmons, of Batesville; Britney V. Ngo, of Ridgeland; and Emily Christine Wright, of Gulfport. Doris Raymond Honors Scholarship recipients are Martha Peyton Ford, of Brownsville, Tennessee; Ella Rose Endorf, of North Bend, Nebraska; Autumn Elizabeth Fortenberry, of Magnolia; Andrew Stephens Gardner, of Oxford; Samuel Patrick Starr, of St. Jacob, Illinois; and Claudia Hayden Williamson, of Ocean Springs. Receiving Harold Parker Memorial Scholarships are deYampert Brame Garner II, of Batesville, and Lilly Arabella Hamm, of Germantown, Tennessee. Kaden Seth Spellmann, of Amarillo, Texas, and Ajah Tiyanna Singleton, of Edwards, are recipients of Annexstad Family Foundation Leaders for Tomorrow Scholarships. Li is a graduate of Oxford High School, where she was concert master of the OHS Orchestra, which she played in for four years, and received awards in AP chemistry, geography, and anatomy and physiology while being named to the National Honor Society, Beta Club, Anchor Club and LOU Orchestra. She also made the Principal’s List Honor Roll all four years and was a volunteer with the Oxford-Lafayette Humane Society, Oxford-Lafayette County Library and Memory Makers. She is majoring in chemistry. A graduate of Mississippi School for Math and Science, Kimmons was a Regional Science Fair finalist; member of the marching band, Student Council, National Honor Society, Student Government Association and Technology Student Association (regional/state winner); and earned awards in Spanish, regional spelling bee, Honor Roll-All A’s, Beta Club (regional/state winner) and second-highest average. She also volunteered at the Boys and Girls Club and the Convoy of Hope and was a chemistry tutor. She is majoring in chemistry. Ngo is a graduate of Ridgeland High School. An AP Scholar and STAR Student, she was a member of the National Honor Society and received highest average awards in AP calculus and language and composition. She is a percussionist, and she served as a volunteer at Grace Place Soup Kitchen, Salvation Army Angel Tree and as donor-director at the high school blood drive. She is majoring in pharmaceutical sciences. Wright graduated from Harrison Central High School, where she had the highest average in AP chemistry, English II and English language. The student council president, her memberships included the National Honor Society (president), Spanish Honor Society, National Beta Club, Mu Alpha Theta (president) and Key Club International (Dist. 14B Lt. Gov.). A Mississippi Governor’s School and Trent Lott Leadership Institute for High School Students participant, she was a member of the varsity soccer team, along with the Interact Club and Students Against Destructive Decisions. She is majoring in biomedical engineering. Ford, a graduate of Washington Lee High School, was in the Haywood County Schools Prodigy Program for Gifted Students for eight years and also made Academic First Honor Roll (all A’s over entire school career). She won a silver medal on the National Classical Etymology Exam and was chosen to represent Tennessee public schools at Washington Journalism and Media Conference. Her major is journalism. A senior class vice president, Endorf set a record for the highest ACT score at North Bend Central High School. Her awards include Nebraska Academic All-State, National Society for High School Scholars, Nebraska representative at the Hugh O’Brien Youth World Leadership Conference and Pinnacle Bank Outstanding High School Leadership Award. She is majoring in public policy leadership. Fortenberry won awards in Mississippi studies, AP Honors English, algebra, world geography, biology and economics during high school. She also was a member of the concert and marching band for three years and was president of the student council and DECA. She is majoring in public policy leadership. An Oxford High School graduate, Gardner was a member of the school’s theater program, student council and broadcast program, and sang in his school and church choir. He also was a member of the National Honor Society, Beta Club and Oxford Young Life. He was a guitarist and wedding violinist for hire. He is majoring in integrated marketing communications. Starr is a graduate of Triad High School, where he was a member of the National Honor Society, Student Government, Model United Nations and Madison County Youth Board. He was an Illinois State Scholar and won numerous awards at the University of McKendree Model United Nations. He is majoring in international studies. An Ocean Springs High School graduate, Williamson was president of the Ocean Springs Mayor’s Youth Council, co-founder and secretary of the OSHS Debate Club, committee chair at the Mississippi Youth and Government’s Youth Legislature and chief justice at the Model UN. A National Honor Society member, she was on the principal’s list, 30+ ACT Club, American Legion Auxiliary’s Magnolia Girls State and Palazzo Youth Leadership Summit. She is majoring in international studies. President of the Mu Alpha Theta chapter at South Panola High School, Garner was a member of the National Honor Society, National Technical Honor Society, Beta Club and Technology Student Association. A football statistician and videographer, he also served as basketball manager-statistician. Garner also had the highest averages in AP physics, construction, U.S. history and dual-enrollment biology. He is majoring in accountancy. Hamm graduated from St. Agnes Academy, where she was a member of the National Honor Society. She earned academic honors in world history, U.S. history and English, and was named “Most Valuable Player” of the varsity lacrosse team and editor of the yearbook. Hamm is majoring in integrated marketing communications and economics. An Eagle Scout, Spellmann is a graduate of Amarillo High School, where he was a member of the National Honor Society and a Superintendent’s Scholar. Captain of his mock trial team, Spellmann served on the United Way Youth Cabinet, student council, Upwards Basketball, UIL Academics Speaking Events and Snak Pak 4 Kids. He is majoring in economics. Singleton is a graduate of Raymond High School, where she made the principal’s list, honor roll and held the highest average in world history, U.S. history, physical science, algebra II, English II and Madrigals. She is majoring in biomedical engineering. For more information about the Sally McDonnell Barksdale Honors College, visit http://www.honors.olemiss.edu/.